When Bricia Lopez gets into a discussion about "mom guilt"– a term used to describe the remorse many moms experience when trying to balance children, career and household responsibilities– her voice takes on a different tone. 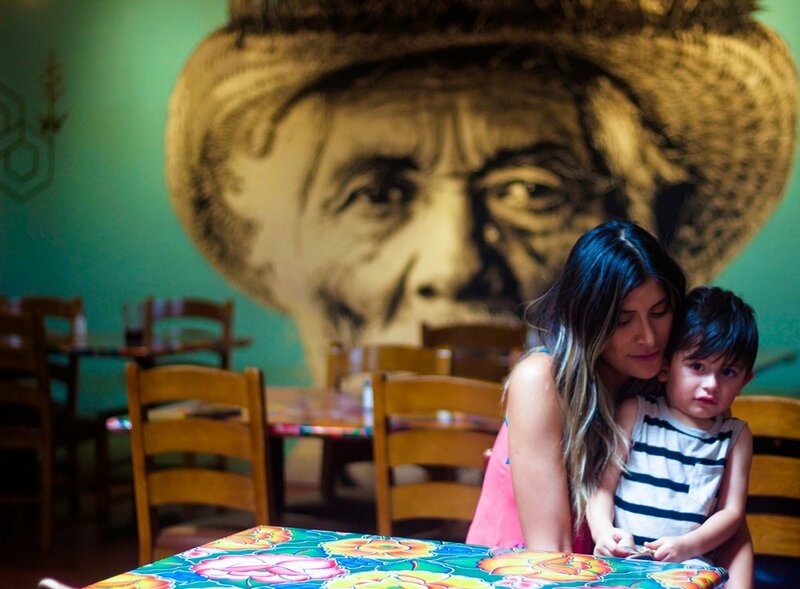 Sitting in the back of her family's nationally-acclaimed La Guelaguetza Restaurant in Koreatown, Lopez watches over her 2-year-old son Eddie, who is having a typical fun-filled afternoon that involves running down to the restaurant’s main dining hall, removing his sandals and climbing chairs at different tables. Lopez and her older sister Paulina host a successful podcast titled The SuperMamás Podcast, which has brought them fame with listeners from as far as Afghanistan and Australia. Their fans relate to their talks about motherhood and raising kids in Los Angeles. But prior to launching the podcast, before Lopez became a mom, she was frequently absent from Paulina’s home during a time when Paulina needed extra support raising a newborn and a toddler. “Why did I have to be there to help? It was her decision to have kids,” Lopez would think to herself. But when Lopez delivered her son Eddie, she was overcome by emotions including a sense of culpability that was attached to her lack of involvement in her sister’s earlier motherhood journey. “I couldn't believe how selfish I was. I couldn't believe that she had gone through this twice, by herself!” she recalls. “She felt alone." While customers at La Guelaguetza order their favorite entrees, which mainly consist of dishes from Mexico’s southern state of Oaxaca where Lopez was born, she sits in her back office. The popular restaurant that once belonged to her parents, was acquired by Lopez and her three siblings five years ago. Lopez is in charge of the venue’s larger-scale operations, like marketing, sales and events. In 2015, Lopez decided to support her sister’s aspiration to have a podcast where they could both discuss the many nuances of motherhood. Lopez went online and researched everything necessary to create a podcast. Space wasn’t a problem. They used a small area of the restaurant to create a recording studio. Equipment wasn’t hard to obtain, they invested some of their business income to purchase what they needed. Editing and streaming wasn’t hard, Lopez had spent countless hours researching and learning online. When all the elements were in place, they set off to produce their first show. What Lopez achieved was a sense of closure from the days she hadn’t spent enough time with Paulina. Together, they learned that mothers near and far were relating to their experiences. “Everyone needs to be encouraged to go on their journey. “The more empowered people feel, the better off everyone is,” says Lopez. Two years later, the Super Mamás Podcast has proven to be a major success for the Lopez sisters. So much that major corporations like McDonald’s, Target and Macy’s have partnered with them for social media campaigns and engagements. On Saturday, September 16, Lopez and her sister will be at Macy’s in Los Cerritos celebrating Hispanic Heritage Month with live performances, photo opportunities and other activities. Lopez started working at La Guelaguetza Restaurant when she was fifteen. Before that, she had been immersed in her dad’s Mezcal business in Oaxaca. In 1994, the family moved to Los Angeles when Lopez was nine years old. She didn’t speak English at the time. “Growing up in Mexico was very important for me,” says Lopez. She makes yearly trips to Mexico with her son and plans on giving him an organic way to fall in love with her birthplace. Plus, the 2-year-old boy is already familiar with unique aspects of Oaxacan culture. The restaurant features a store with Oaxacan made goods. There is artwork representative of Oaxaca and many of the dishes he’s been enjoying since he was introduced to solid foods are specifically from the region where Lopez spent her early childhood. Those include the likes of fried grasshoppers and the famous chicken dish with a special dark brown sauce called mole, for which La Guelaguetza has received awards and praise from tough food critics. As Lopez walks from one end of the restaurant to another, her son follows her and smiles with a type of contentment that comes from feeling safe and belonged in his mom’s environment. Mommy In Los Angeles® had the pleasure of spending time with Bricia Lopez at La Guelaguetza Restaurant for a conversation on motherhood and the relationship between sisters who grow up with the same values, while embracing different perspectives. The Lopez sisters have inspired many moms to dream big and pursue their dreams and supported local causes and projects, including our own efforts behind the Mommy In Los Angeles® brand. We thank them for their commitment in maintaining a supportive sisterhood that extends far beyond their family unit.